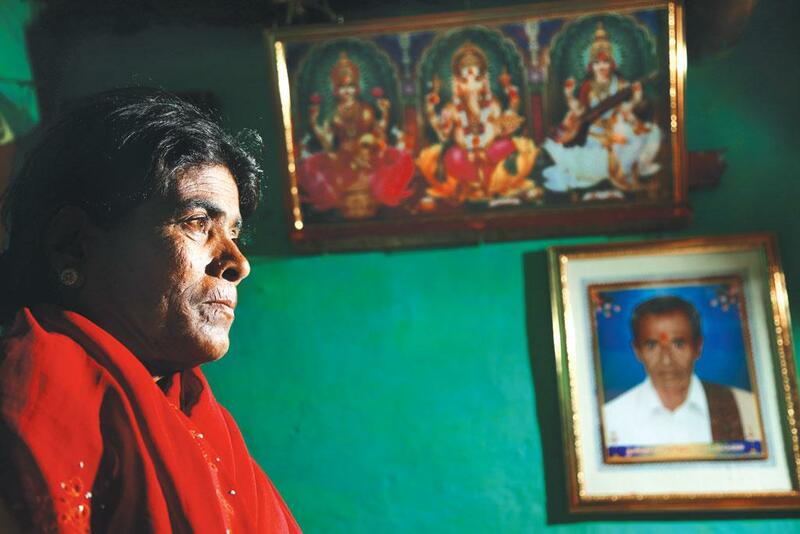 On June 25, when 61–year-old Ninge Gowda left for his field in the morning, nobody at home had a clue about what was going through his mind. On reaching the field, Gowda set the ready-to-harvest sugarcane crop on fire, and jumped in, ending his life. Gowda was a resident of Karnataka’s southern sugar bowl district of Mandya and owned a 0.2 hectare (ha) in Pandavapura block. He was depressed because there were no buyers for his crop. The mature crop has to be harvested at the right time, else it loses weight. But the sugar mill in his locality, Pandavapura Sahakari Sakkare Karkhane (PSSK), run by a farmers’ cooperative society, had suspended crushing of sugarcanes a few months ago. Similar was the case with the other four mills in the district, including the state-owned Mysore Sugar Company (Mysugar). Mill owners say that five straight years of surplus output has led to a free fall in sugar prices and they have incurred huge losses, particularly in the past two years when the rate of sugar in the open market fell from Rs 30,000/tonne in 2013 to Rs 19,000/tonne now. 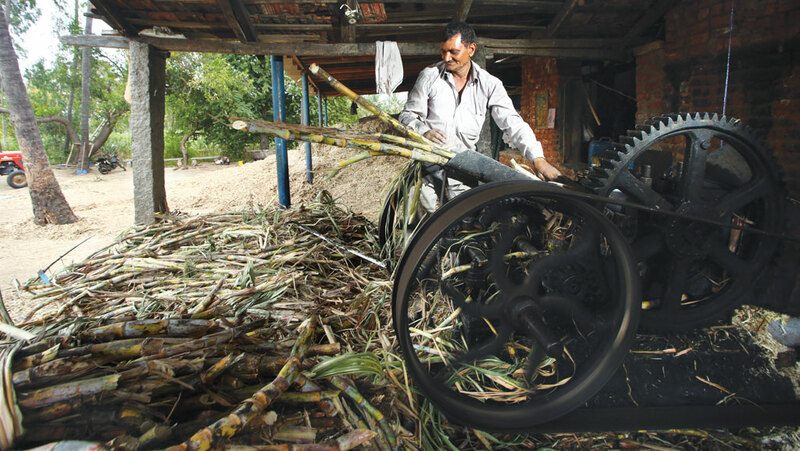 As on June 15 this year, the five mills together had a due of about Rs 127 crore to the farmers for the sugarcane they supplied in 2013-14 and 2014-15. The district administration had served a notice to the mills on June 15, asking them to start crushing immediately, but they did not respond. Gowda’s is not an isolated case. The state has witnessed a spate of farmer suicides since the beginning of June. 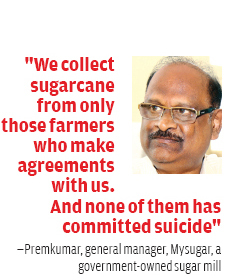 According to Kurubur Shanthakumar, president of Karnataka State Sugarcane Growers’ Association, 108 farmers have committed suicide between June 1 and July 20. “A majority of them are sugarcane farmers,” he says. In Mandya alone 13 farmers have committed suicide since June, says the district administration. “My husband was extremely worried about our mounting debt,” says Boramma, Gowda’s widow, a wage labourer, who is yet to overcome the shock of her husband’s death. Gowda had borrowed Rs 1.5 lakh from a moneylender at an exorbitant interest rate of 36 per cent five years ago when his son Erra Gowda had to undergo a surgery after an accident. The moneylender was demanding that the family pay the debt. As the pressure mounted to repay the loan, Gowda had no other option but to sell his crop to a small jaggery-making unit in the locality. “My father became all the more upset when the jaggery unit offered him just Rs 700 for a tonne of sugarcane,” says Erra Gowda, 37, who manages to earn Rs 150 a day through wage labour. Last year, the price offered by jaggery units was Rs 1,200/tonne. But jaggery has also suffered a fall in prices this year. The price has declined from Rs 35,000/tonne in 2013 to Rs 20,000 now. The district has about 4,000 small jaggery units but three-fourths of them have shut shop. Mandya, with good irrigation facilities, has 40,000 ha under sugarcane. “At present, mature sugarcane crop in at least 6,000 ha is dying,” says Rohini Sindhuri, chief executive officer of Mandya district panchayat. Karnataka is the third largest sugarcane producing state in the country after Uttar Pradesh and Maharashtra. According to the 2014-15 data of the state government, Karnataka has one million sugarcane farmers and around 0.6 million ha under the crop. There are 63 big sugar mills in the state of which 19 are cooperatives, two in the public sector and the rest are private. The Sugarcane (Control) Order of the Union Ministry of Agriculture and Irrigation makes it mandatory for all the sugar mills in the country to pay the farmers the price of their produce within 14 days of procuring sugarcane. The Karnataka Sugarcane (Regulation of Purchase and Supply) Act 2013 also says that sugar mills should clear the dues within 14 days of procurement. Defaulting mills are liable to pay dues with interest at 15 per cent a year or face punishment. But the mills never pay in the stipulated time. The arrears for 2013-14 were Rs 925 crore and Rs 3,200 crore for 2014-15. In 2013-14, the Central government had fixed a fair and remunerative price (FRP) of Rs 2,100/tonne of sugarcane at a recovery rate of 9.5 per cent (if one tonne of sugar is produced from 10 tonnes of sugarcane, the recovery rate is 10 per cent). For every one per cent increase in the recovery, the mills were supposed to pay an extra amount of Rs 235/tonne to farmers. Besides this, in 2013-14, the state government had fixed Rs 2,500/tonne as state advised price (SAP) or minimum support price to help the farmers. In November 2013, the Karnataka Sugarcane Control Board also directed all the sugar mills in the state to pay Rs 2,500/tonne to sugarcane growers. For 2014-15, Karnataka has fixed its FRP at Rs 2,200/tonne at 9.5 per cent recovery rate. However, only four-five mills, such as Mysugar and PSSK, have been following government directives. “The cost of cultivating, harvesting and transporting the sugarcane to the mills is around Rs 800/tonne,” says Boregowda, a farmer of Shivahalli village in Mandya. If the sugarcane is bought by mills at FRP or SAP, the farmers can earn a reasonable profit, but this does not happen. “The other mills followed neither the Centre’s nor the state’s norms,” says Shanthakumar. Instead, they moved the Karnataka High Court to be exempted from paying SAP. But the court too, after giving a stay order initially, ordered the mills to pay SAP to the farmers. This order was also not followed. Unlike other sugarcane-producing states, in Karnataka, sugarcane farmers are small and marginal, with an average landholding of just 0.2 ha. A majority of them do not have access to bank credit and heavily depend on private money lenders. Boregowda points out that the few farmers who manage to get loans from bank are not able to repay. “If we fail to repay bank loans within one year, the interest rate goes up from four per cent to 14 per cent,” says Nagaraja Gowda, a farmer who owns 0.8 ha in Pandavapura. To avoid the delay in payment by the mills, most of the farmers sell their produce to jaggery units, though they offer a much lower rate than FRP. But most of Karnataka’s 80,000 jaggery units too have gone sick. “Whom should we approach for help? 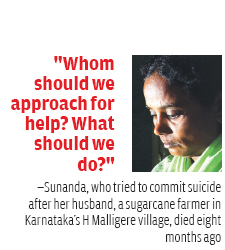 What should we do?” asks Sunanda of H Malligere village of Mandya district, who attempted suicide by consuming poison on July 9. Her husband suffered a heart attack and died eight months ago. She has two college-going daughters. India produced 27 million tonnes of sugar in 2013-14 while the requirement was 23 million tonnes. The domestic sugar market is also flooded with cheap imported sugar, mainly from the world’s biggest sugar exporter, Brazil, say mill owners. Sugar prices in the global market too dipped to their lowest levels in nearly six years along with the weakening of the currency of Brazil. These factors have led to fall in sugar rates in the country. “Food, ice cream and beverage manufacturers, including soft drink giants such as Coca Cola and Pepsi, are allowed to import sugar. The import duty of sugar was as low as 15 per cent till six months ago,” points out K S Nanjunde Gowda, farmer leader and chairperson of PSSK. To arrest the fall in local prices and to help farmers, the Central government hiked the import duty to 40 per cent this April after much hue and cry from sugarcane growers and mill owners. Besides, the price of sugarcane is going up every year, say the mill owners. 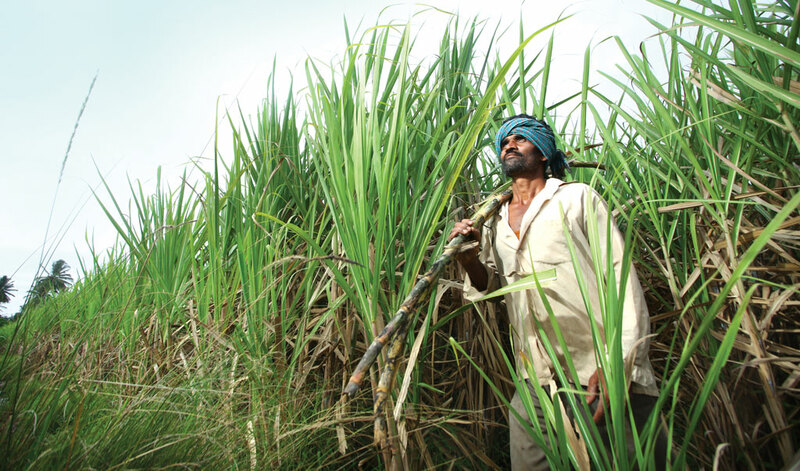 “The production cost of one tonne of sugar, including labour charge, is Rs 32,000. Right now the market price of sugar is Rs 19,000/ tonne. We are incurring huge losses and are unable to pay even FRP,” says Pavan Kumar, president of South Indian Sugar Mills Association, Karnataka. Many mills still have unsold stocks of sugar in their godown. 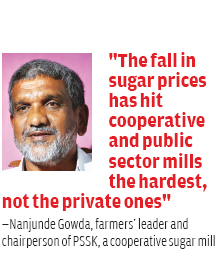 Nanjunde Gowda says the price crash of sugar has hit the cooperative and public sector mills the hardest, not the private ones which earn a profit from bagasse, molasses and ethanol—byproducts in a sugar mill. Bagasse can be used to produce electricity. Private mills which produce electricity can sell it to the government at a rate of Rs 5.15 per unit. Similarly, from one tonne of sugarcane 40 kg of molasses can be produced, which, in turn produces 30 litres of alcohol. As for ethanol, from one tonne of sugarcane, 90 litres of ethanol can be produced which fetches about Rs 50/litre. In Karnataka, 29 private mills have the facilities to make electricity, spirit or ethanol. “While private mill owners wax eloquent about their losses on sugar, they say nothing about profits made through these byproducts,” says Nanjunde Gowda. The mill owners register different companies for these products and their profit never appears in the parent company’s records,” he says. The fact that there has been an increase in private sugar mills in the state shows they make profits, he adds. He also points out that mills in the cooperative sector do not have funds to set up expensive facilities for making these products. Sugarcane farmers’ organisations in the state have been holding agitations for the past six months. Chief Minister Siddaramiah and minister for cooperation H S Mahadeva Prasad have assured the growers that the government will rid them of their woes. On June 24, the government seized sugar stocks at a few private mills and sold them in open market. “The government has already cleared Rs 321 crore on June 10 to the deputy commissioners of the sugar-growing districts as the first instalment of 2013-14 dues payable to sugarcane growers. This will be deposited in the bank accounts of farmers,” said the minister in the state Assembly on June 30 . The state government has set July 31 as the new deadline for sugar mills to pay the dues. The state Cabinet has also decided to take an all-party team to meet the prime minister and ask him for help. However, the growers are apprehensive of the state government’s promises and actions. As Shanthakumar points out, the decision to seize sugar stock came very late and the mills have already threatened to suspend crushing sugarcane if this continues. “We are apprehensive because most of the mills in the state are owned by politicians of different parties, sitting ministers, members of Parliament and members of State Legislative Assembly. No political party will dare to do anything against the sugar mills,” he says. If the government is committed to help farmers why doesn’t it order a takeover of those mills in the state which have suspended crushing and start the process so that more suicides can be avoided, he asks. There is a need to strengthen the mills in the cooperative sector and the small jaggery units because the farmers depend the most on these, Shanthakumar concludes. According TO the 70th round of National Sample Survey Office data, 52 per cent of India's agriculture households are in debt. 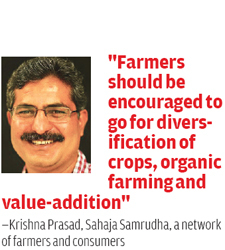 On an average, each agricultural household has an outstanding loan of Rs 47,000. The southern states are worse off than the northern states. In fact, the top five states of the country in terms of agricultural debts are the five southern states. 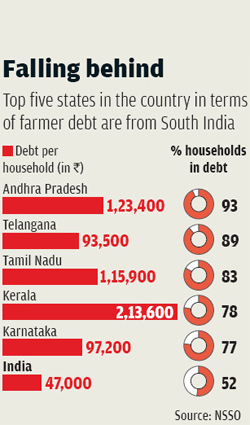 Andhra Pradesh tops the chart, with 93 per cent of households facing debt, followed by Telangana, Tamil Nadu, Kerala and Karnataka (see table). Experts say that farmers fall into debt traps because they take loans to meet aspirational needs, such as for purchasing a vehicle or spending on weddings. News reports say that the Reserve Bank of India has taken note of this diversion of agricultural loans for non-agro purposes and has begun a probe to curb such malpractices. Though a recent National Crime Records Bureau report says that farmer suicides in India have seen a drastic drop, in states like Karnataka 37 per cent of suicides have been due to agricultural debts and crop failure.